The Adductor Canal is an intermuscular tunnel situated on the medial side of the middle one-third of the thigh. 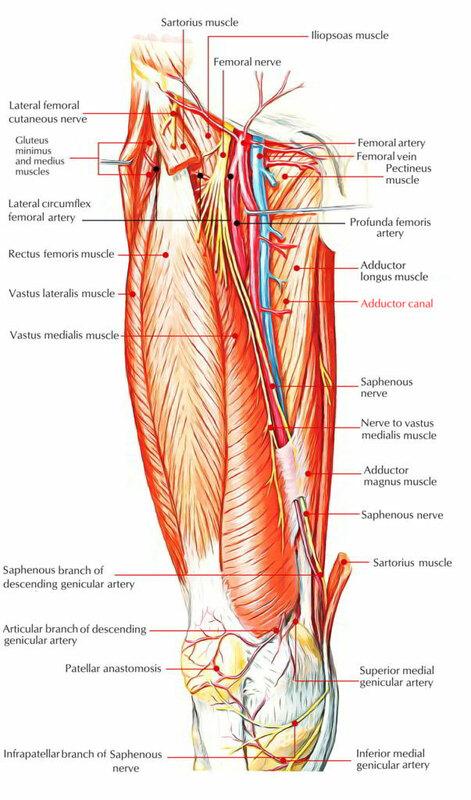 Adductor canal is 15cm long and stretches from the apex of the femoral triangle, above, to the tendinous opening in the adductor magnus, below. Adductor canal gives passage to the femoral vessels from femoral triangle to the popliteal fossa. Anterolateral wall: It’s created by vastus medialis. Posterior (floor): The posterior wall of adductor canal is created by adductor longus aboveand adductor magnus below. Medial (roof): It if created by a powerful fibrous membranestretching across the anterolateral and posterior borders. The roofing is overlapped by the sartorius muscle. The subsartorial plexus of nerves is located on the roofing underneath the sartorius. The plexus is composed by branches from the medial cutaneous nerve of the thigh, the saphenous nerve, and the anterior section of the obturator nerve. It supplies the overlying fascia lata and the skin. Anterior and posterior sections of the obturator nerve (occasional). Descending genicular artery, a branch of the femoral artery. The femoral artery enters the canal at the apex of the femoral triangle, traverses the entire length of the adductor canal, and leaves it by going through the tendinous opening in the adductor magnus (adductor hiatus). Inside the canal it produces muscular branches and a descending genicular branch. The descending genicular artery appears before the femoral artery leaves the canal. The femoral vein is located posterior to the femoral artery in the upper part and lateral to the artery in the lower part. The saphenous nerve (longest cutaneous nerve of the body) crosses the femoral artery anteriorly from lateral to medial side. It leaves the adductor canal by piercing the fibrous roof. Just before leaving the adductor canal it produces infrapatellar branch which pierces the sartorius, and joins the patellar plexus and supplies the prepatellar skin. The nerve to vastus medialis (thickest muscular branch of the femoral nerve) is located lateral to the femoral artery, and enters the vastus medialis in the upper part of the adductor canal. The posterior section of obturator nerve runs on the anterior outermost layer of the adductor magnus and ends by supplying the knee joint. The spiral course of the femoral vein and saphenous nerve with regard to the femoral artery in the adductor canal is because of medial rotation of the lower limb during its development. The femoral artery is exposed and ligated in the adductor canal during surgery for aneurysm of the popliteal artery. This is since the artery at this side is healthy and will not split when tied, which might happen if the artery is tied in the popliteal fossa immediately above the popliteal aneurysm. This process was initially performed by a well-known surgeon, Dr John Hunter. 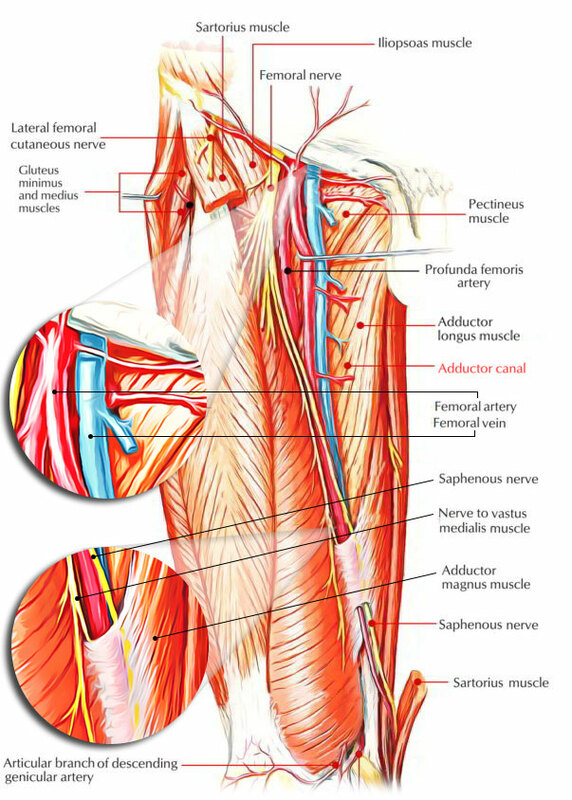 The adductor canal was referred to as after his name as Hunter’s canal. After ligation of the femoral artery in the adductor canal, the collateral circulation is created via arterial anastomosis around the knee joint.